On the 1 July 1945 at 3am a dull red glow on the horizon a few points to starboard could be seen, "it was Balikpapan on fire", a result of rapidly increasing Allied air and naval bombardment against this NEI port on the south-east coast of Borneo. A massive scale of attack begun in October the previous year and was intensified during the second half of June when Balikpapan was hit by up to 200 bomber missions per day in one of the heaviest air strike offensives against a single objective. Radio Tokyo had told the Australians on the convoy they knew what they were up to, but was paid no particular Japanese attention on their sea journey from the staging island port of Morotai. The divisional amphibious landing at the beaches on Klandasan was hoped to achieve a quick result by seizing the key point of the enemy’s defences in the initial assault, split and disorganise his forces with the intention of shortening the campaign and save allied lives. On F-Day, at five minutes before 9am, the first assault craft in the divisional operation Oboe Two barged down their ramps on the scorched sand to reveal a scene of desolation. Three battalions from the AIF 7 Division (Maj-Gen Milford), the 2/10 and 2/11 of the 18Bde (Brig Chilton) and the 2/27 of the 21Bde (Brig Dougherty), hit the blackened beach at Klandasan. Against the background of billowing smoke and noxious burning oil stood shell splintered coconut trees, the rubble of buildings and native huts aflame where the resolute Japanese fired a few scattered harassing shots then withdrew into tunnels, camouflaged pillboxes, concrete strongpoints and connecting entrenchments. Which the Japanese had dominated the features inland with and have had plenty of time since January ’42 to fortify. And for the first time in its short illustrious history the three proper allocated brigades of the Australian Seventh fought as a complete division. After the rocket fitted LCI(R)’s had provided a last devastating concentrated bombardment Matilda dozers and a bridge-laying tank cleared passages from the beach to the main road. The RAN beachmaster reports flow in, each wave arriving on schedule, there is no resistance yet, have been no casualties on the beaches and the complete satisfaction that the obliterating bombardment of the beach defences had been assured. Then 2/9AR modified Matilda’s and flamethrowing Frogs ploughed across the soft sand of the beach and inland to support the forward infantry. With tank support the ground movement forward through the rubble of houses and oil installation wreckage would have been difficult enough, but tanks of the 2/1AR had bogged down just off the foreshore and were delayed in being brought forward over destroyed debris. Whilst this was happening the artillery support had arrived onshore in LVT’s, the first ashore was number 9 Battery from 2/5FldRgt, armed with eight Australian designed and manufactured short 25pdrs, and accompanied by 4.2inch mortars blasted the Japanese defences on the dominating features. The manhandled 6pdr’s of 2/2 Tank Attack Regt, closely supported by the infantry of 2/10Btn, were mopping up the many Japanese bunker positions on Hill 87 at a few hundred yards that were still active after massive air and naval bombardment. In due time a gun Matilda accompanied by a Frog approached one of the enemy positions littering Parramatta Ridge, that had been turned into a Japanese man-made citadel topped with a cunning trench system while underground was a vast intercommunicating honeycombed network of tunnels. The Matilda II’s blasted openings into the concrete bunker with its solid shot 2pdr gun and then the Matilda Frog fired jets of flame through the holes. 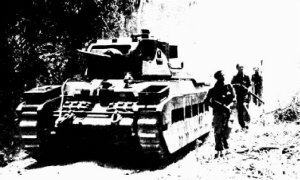 Many tunnel entrances led into the hills and the bypassing of these tunnels would have left the rear open to attack, so CS Matilda tanks demolished the many entrances with 3inch howitzer shells to entrap the occupants then Frogs roared into the dark openings fierce jets of flame. Launching a three-pronged attack on Balikpapan town 18Bde with 2/9Btn supported by a troop of Matildas, and a Frog, captured the Japanese radar station on Signal Hill and advancing around Cape Toekoeng cleared the harbour front north to the old oil refinery. The 2/10Btn crawled through the twisted wreckage of the refining installations to occupy the town and power station. To complete the occupation of Balikpapan the 2/12Btn had pushed north-west to clear the industrial area. Here enemy had fortified the nearby features, Nail & Nurse, defended by heavy mortars, duel purpose anti-aircraft guns and delayed the Australians manoeuvre to take Pandansari. With the navy and artillery the Japanese weapons were silenced then a company of the 2/12Btn, again with Matilda tanks in support, took the scarred hilltops during the late sultry afternoon. The bold strategy had been successful and careful planning on the vital first day saw the Australians overrunning numerous heavily defended localities, denied the Japanese the high ground and split open the crust of his defences protecting the town itself and the docks area. The die-hard stray Japanese soldiers, that would sniper with a rifle, were scattered about the rear areas and they too had to be winkled out as well. The Fire Support and Covering Group provided the big naval gunfire assistance according to the speed of the advance and behind the battling front line the bomb-disposal chaps were dangerously finding and delousing numerous heavy mines. On Vasey Highway, the name given to the main road on Balikpapan, the tanks supporting 21Bde were halted by a enormous crater and after preparations, artillery bombardment plus an infantry attack round the right flank the bridge-laying tank moved forward to span the crater and let the four mixed Matildas through to engage the entrenched enemy. One Matilda was temporarily disabled by a contact mine but the combined attack gained the objective, also capturing four heavy Japanese mortars. The industrious Japanese had constructed a new airstrip at Sepinggang, had improved the old Dutch airfield at Mangger and from these bases allied bombers are within easy range to the Co-Prosperity Sphere absorbed Celebes and Java islands. The 2/14Btn secured the airstrip at Sepinggang then immediately work began on the badly cratered surface and was serviceable for Auster scout planes by midday on the 3 July. At the old airstrip on the coast LCM’s (Landing Craft Mechanised) carrying a troop of three Matildas were put ashore at Manggar Beser on the north bank of the river and hopefully they would be defiladed from the strong overlooking Japanese high ground positions of bunkers, tunnels, trenches and two 120mm naval guns with range- finder and command bunkers. One Matilda was badly damaged while the other two were destroyed in flames killing one man, wounding the troop commander and others. They were hit by one of the enemies’ heaviest gun, a 155mm at reasonable point blank range. It was a coastal defence gun set into the hillside and protected by heavy steel doors. And all day long a duel continued between naval guns and aircraft verses the Japanese weapons but the enemy could not be silenced. The artillery moved up a 25pdr gun placed under Sergeant Palmer, 2/5FldCo and veteran of Buna, to within eight hundred yards and at first light shot hits through the steel doors destroying the gun and killing the crew. After all the enemy opposing big guns were silenced the engineers quickly repaired the demolished bridge portions of the Manggar Bridge spanned structure. Thus enabling supplies and ammunition to be brought forward in exchange for the casualties of war, like the indigenous refugees flocking to the Australian front line positions to be met by the Diggers of the 2/27Btn and passed to the rear civilian allied repatriation services. Further along the highway the continuing advance by the 2/14Btn, as the spearhead point, had crossed the Adjiraden River. During the following days patrols were ranging far forward through the village of Bangsal, reaching to Amborawang and a special recon team penetrated to the heart of Sambodja on the 14 July and witnessed the burning of the village by pro-police boys supervised by a party of stalwart Japanese. Three more Matilda tanks were landed at Manggar Beser, this time covered by a smoke screen and moved onto the airstrip to support the rear areas in destroying Japanese soldiers infiltrating at night across the airstrip, the enemy caused little damage and invariably suffered heavy losses. In the darkness the naval gunfire of the starshells and other artillery pieces were used to illuminate no-man’s land so effectively that the Japanese eventually made few infiltration attempts. Back at the Klandasan beachhead huge ordnance and engineer dumps were rapidly expanding, vehicles of all descriptions, tanks, jeeps, bulldozers, Alligators, graders, light & heavy transport trucks and motorcycles cluttered the tracks inland from the dispersal areas. Large floating docks, brought a nautical 800miles to be with the assault convoy, now spanned the shallow water between the beach and the landing ships. Landing craft ferried in equipment and supplies ashore during the day, then all night and disgorged hundreds of tons of cargo to be distributed forward. In the low hills and spurs of the terrain surrounding the Milford Highway, the road to Samarinda and the timbered interior, was lined with shattered houses, layered with craters and a obstacle course of burnt out cars, trucks, knocked-out heavy artillery tubes of various calibres and emplaced, what were once, search-light apparatuses. The Japanese garrison was strongly entrenched on these hills and spurs and stayed in their bunker positions during the day but at night small parties infiltrated through the front lines and short sharp hand to hand combat occurred regularly. Then the enemy cracked and probing forward one morning the push gained momentum as the Japanese retreat was faster than the advance, moving so recklessly that contact was lost by nightfall. On the left the 2/7 Commando cavalry Regiment teams were aggressively patrolling east to harass the enemy’s line of communications and further to the left were Dutch NEI troops advancing to a position north of Pandansari. The AIF 25Bde pressed its advantage across the jungle-clad hills and spurs to the left of the Milford Highway named road. Supported by Matilda tanks plus a Frog D’ Company 2/31Btn stormed one hill position, so too C’ Company another high feature and in the early afternoon artillery, mortars and tanks paved the way for a further advance by D’ Company destroying emplaced gun positions and ousting bunkers with red and white hot flame. Later in the afternoon ‘A company prepared to attacked another dominating highpoint Coke Spur, a two and a half hour barrage by 25pdrs came down. Close supporting tank attack artillery units armed with towed 6pdrs combined with 4.2inch mortars hit the hill and two Matildas and a Frog that were lined up on the highway gave direct over the open sights support that crackled from the 2pdrs and machine-guns. The barrage was cut short and the three metal tanks crawled forward in line ahead with three sections of soldiers in between and bunched close behind the green jungle crunches. "Then it happened!" The Japanese ambush was sprung with machine-gun fire from both sides of the jungle road sweeping the column, retreat meant being caught, and to stay was to be hemmed in by the cutting. Australian artillery re-opened up, the tanks blazed away close range at the strongly hidden enemy and the battle raged for nearly two hours in that confined ambush area. One Matilda stood its ground giving covering fire, while one tank, then the other tracked back carrying the many wounded casualties on the top deck. The Australian advance had been brought to a standstill and there were many volunteers wanting to bring in the dead but there was evidence that the diabolical Japanese had booby-trapped the bodies. That same day the duplicity of the Japanese tried to repeat this success in another ambush encountered – this time eight of the intendant assailants were in turn killed and many others wounded by a small group from the 2/7 Commando cavalry Regiment in this sector, the commandos had no casualties at all. Here on the Milford Highway for twelve days the Japanese clung firmly to his domineering pillbox and bunker positions placed on each side of the route holding the high ground and where the warfare was a slow grinding down process of heavy shelling, constant aggressive shoot and scoot combat defence and continuous nerve racking enemy night infiltration tactics. Then the Japanese broke contact and with high command orders "to capture and hold Balikpapan area" there were no further northern advances along the Milford Highway, even though there were still patrol clashes, the continuing at dark banzai suicide raids by the Japanese soldiers, basically at the lines of supply, and enemy stragglers to be hunted down. 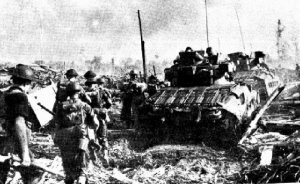 During the Borneo Campaign the 1Armoured Regiment had returned to the fray into the fierce fighting at Balikpapan. This armoured force under the command of Maj Ryrie, killed in action 10 July 1945, included two squadrons Matilda II’s, one 3inch howitzer armed CS Matilda per three tank troop, one troop of Frogs and one bridge-laying tank. 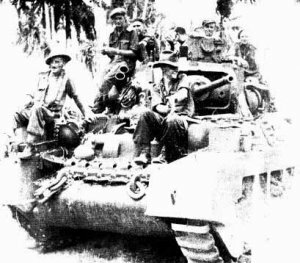 Another Australian tank unit in the Balikpapan campaign was a fully equipped circus formation, the 2/1 Brigade Armoured Reconnaissance Squadron. Through the whole course of the Balikpapan battles engineers and sappers cooperated in destroying 110 tunnels, pillboxes and bunkers, and more than 8,000 various mines and tricky boobytraps were disarmed. In one attack to capture the anti-aircraft fire-base at Cape Pendjam, on the opposite side of Balikpapan Bay where the enemy opened up on the invasion force with a 5inch coastal gun that was knocked out by quick reaction naval gunfire. A small amphibious operation was carried out in armoured Alligator LVT’s (Landing Vehicle Tracked) by ‘C Company 2/9Btn and 2/7 Commando cavalry Regiment, less detachments. The task force crossed the bay in line ahead, then manoeuvring into amphibious groups of line abreast wheeled onto their tracks and sped across the beach in intervals of between two and three minutes, within the hour Australian armoured infantry had fanned out securing all objectives. And two Matildas that came ashore were only to be bogged in twelve feet of sticky mud in the smelly swampy beach area. "The operation (Balikpapan) was a lesson on the use of fire-power," wrote Brigadier Dougherty in his Balikpapan after action report. "The old hands of this division (the AIF 7th) remember the Owen Stanleys where they had no artillery, Gona where 250 rounds of a 25pdr was all we could accumulate for the final assault on the (Buna) Mission and where one tank would have saved 200 lives if we had only had it. At the beginning of August the 7 Division, with attached assets, expanded its defensive boundary around Balikpapan area and by the time hostilities ceased the adversary had been driven away from the populated areas and into the deep dark unfriendly jungle where the Japanese soldiers lacked supplies. Vice-Admiral Kamada who led the Japanese forces at this time in Dutch Borneo compiled with the surrender order on the 8 September aboard the frigate HMAS Burdekin that had rendezvous fifty miles north of the battle-zone of Balikpapan off the Mahakam River Delta. 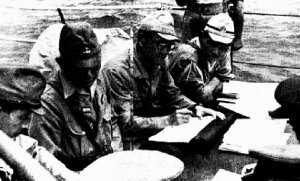 Witnessed by Allied representatives of all the national services operating against occupied Borneo, with the surrendering emissaries an picture of abject misery as the Japanese naval officer signed the document after understanding and acceptance then placed his sheathed sword on the piece of paper as a token of capitulation. An act that was repeated numerous times throughout Asia in conjunction with the main show in Tokyo Harbour on board the USS Missouri ending 2,194 days of war encompassing the world.